Among the various approaches for flexible electronics developed by researchers, one way is to directly fabricate electronic devices on flexible substrate through low-temperature processes, such as plastic film and flexible printed circuit boards. Another successful approach is to use transfer printing, where the fabricated functional devices are transferred by elastomeric stamps onto hard and planar substrates using standard processes and printed on desired flexible and stretchable substrates. "Despite the extraordinary success of these approaches in reaching functional devices with great flexibility and stretchability, the involvement of flexible and elastomeric substrates, which have low working temperature, prevents the direct fabrication on them using mainstream manufacturing processes, such as high-temperature processes such as annealing, growing and oxidation," Hanqing Jiang, an Associate Professor in Mechanical and Aerospace Engineering at Arizona State University, tells Nanowerk. "Transfer printing, on the other hand, may also cause low fabrication yields and a limitation on the thickness of the functional electronics. All of these, therefore, have significant levels of sacrifice on the performance of electronics." "Instead of using elastomeric substrates to make the device stretchable, there exists an alternative way to enable stretchability, which in fact has been around us since our childhood, namely, origami," says Jiang. "As an art of paper folding, origami is to create three-dimensional structures from two-dimensional sheets through a high degree of folding along the creases. One of the central themes of origami is compactness and deformability of the folded structures." Inspired by a particular folding technique called rigid origami, professors Hongyu Yu and Hanqing Jiang from Arizona State University, and professor Yong Xu from Wayne State University have now demonstrated the fabrication of stretchable electronics by utilizing rigid origami, without using elastomeric materials. Reporting their findings in the February 24, 2014 online edition of Applied Physics Letters ("Origami-enabled deformable silicon solar cells"), the team presents a fabrication process that utilizes mainstream high-temperature processes to fabricate high-performance stretchable electronics. In this approach, high-performance functional devices are fabricated on rigid surfaces and do not experience large strain during deformation, and these rigid surfaces are joined by serpentine-shaped interconnects that allow for a full-degree folding and unfolding, which enables deformability. "The principle of origami has been explored for various engineering applications, such as space exploration, e.g., a foldable telescope lens, to automotive safety, e.g., airbags, and biomedical devices, e.g., heart stents," explains Jiang. "Now, we are demonstrating that origami can be combined with standard microfabrication techniques – which are standard processes in the IT industry, such as manufacture of computer chips – for deformable electronics." The particular pattern of the origami technique that the researchers used for their solar cells is Miura folding, named after Japanese astrophysicist Koryo Miura, where many identical parallelograms are linked through ?mountain? and ?valley? creases. Although the Miura-folding can be almost completely collapsed in one direction, the parallelograms remain undeformed. Thus, the deformability, particularly the stretchability of the Miura pattern as a whole is enabled through the folding and unfolding of the creases while maintaining the parallelograms rigid. As Jiang points out, the deformability is prescribed by the creases while the materials of making the origami parallelograms do not experience large strain except at the creases. Therefore, rigid origami provides an alternative way to enable deformability while keeping the high performance of electronics, which opens a new direction of producing flexible, stretchable and deformable electronics. 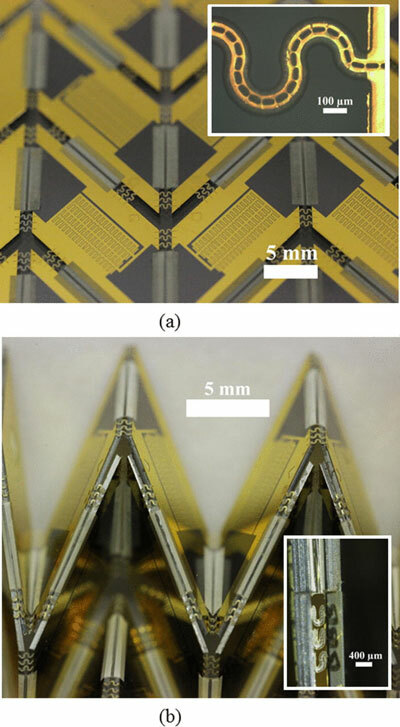 In this specific example of 'Origami electronics', the team fabricated silicon solar cells. The first part, the fabrication of the solar cells, is standard and compatible with the mainstream high-temperature CMOS process. Metal interconnects are then deposited onto the wafer to connect individual solar cells. In the second part, a series of fabrication steps including vapor-deposition of polymer layers (Parylene-C) several etching steps, creates the final origami structure where the solar cells can be folded along the interconnects. As the team demonstrated with their fabricated origami-enabled silicon solar cells, folding results in 644% areal compactness. Watch a video describing the work. "This approach can be readily applied to other functional devices, such as sensors, displays, antenna, and energy storage devices," says Hongyu Yu, an Assistant Professor at Arizona State University. "In fact, we are developing some of these devices as part of our efforts of making origami-based deformable electronic devices." He notes that this versatile approach has the potential to be seamlessly integrated with mature microelectronics processes in order to fabricate functional devices that are able to survive combined stretching, compression, bending and torsion, in both planar and curvilinear states, with heretofore unseen functionalities. While current devices are passively folded and unfolded, the team are also exploring ways to transfer the active driving force for the origami folding to the device itself. Having laid a solid foundation for origami electronics, there are several challenges that need to be solved. For example, the reliability of crease connection will be key for introducing this concept to consumer products. Extensive mechanical and material study and optimization are still needed. Another example is the integration of the above-mentioned active driving mechanism that will open wider applications of this new concept. This integration needs a multidisciplinary approach with innovative materials and designs.